Dietrich Henschel's performance is extraordinary, one of the most impressive vocal displays to come along in many a moon. (...) Billed as "Luciano Berio: In Memoriam", this disc offers an ideal tribute to a major figure in 20th century music. 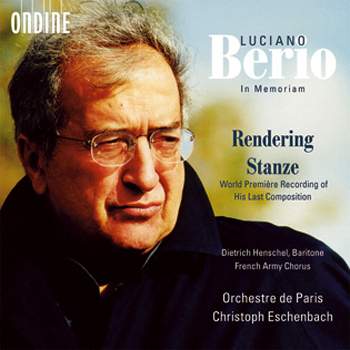 This CD pays tribute to the late Italian composer Luciano Berio and includes the world première recording of his last composition, Stanze (2003). The work was the result of a commission by the Orchestre de Paris and received its first performance in Paris under Christoph Eschenbach in January 2004. Written for baritone, three small male choirs and orchestra, Stanze consists of settings of texts by five poets that were important for Berio: Paul Celan, Giorgio Caproni, Edoardo Sanguineti, Alfred Brendel and Dan Pagis. This recording features Dietrich Henschel as soloist, as well as the French Army Chorus. Christoph Eschenbach leads the Orchestre de Paris also in Rendering (1988-89), an orchestral work based on sketches which Franz Schubert made for a Symphony in D major (D963A), in addition to fragments derived from other Schubert works. Berio filled in the gaps with his own music, and the difference between the two worlds - Schubert and Berio - is one of the major factors in the identity of this work.